Check out the top plays from a busy Wednesday night in the NBA. Holds averages of 12.5 points, 4.8 assists, 1.1 steals and 27.3 minutes in 641 career games (442 starts) with Dallas, New Jersey, Utah and Atlanta…2009 NBA All-Star. Averaged 7.9 points, 4.5 assists and 20.5 minutes in 40 games…1 double-double (point/assist)…1 game with 20+ points…2 games with 15+ points (2-0 record)…13 games with 10+ points…2 games with 10+ assists…9 games with 7+ assists (7-2 record)…14 games with 6+ assists (11-3 record)…18 games with 5+ assists (13-5 record)…8 games with 2+ steals…made season debut vs. POR (1/18/14) and had 6 points (2-4 FGs, 2-4 FTs) and 2 assists in 17 minutes…14 points (4-6 FGs, 2-3 3FGs, 4-4 FTs) and 4 assists before fouling out in 16 minutes at BKN (1/24/14)…14 points (4-7 FGs, 2-4 3FGs, 4-4 FTs) and 7 assists in 24 minutes vs. DET (1/26/14)…14 points (5-8 FGs, 4-6 FTs) and 3 assists in 25 minutes vs. HOU (1/29/14)…16 points (4-8 FGs, 2-3 3FGs, 6-6 FTs) and 4 assists in 19 minutes vs. CLE (2/3/14)…12 points (4-9 FGs, 4-4 FTs) and 7 assists in 23 minutes at BOS (2/9/14)…9 points (3-7 FGs, 1-1 3FGs, 2-2 FTs) and 5 assists in 20 minutes at CHA (2/11/14)…9 points (2-3 FGs, 1-1 3FGs, 4-4 FTs), 4 rebounds and 5 assists in 19 minutes vs. MIA (2/18/14)…9 points (3-4 FGs, 3-5 FTs) and 7 assists in 20 minutes at PHI (2/21/14)…recorded his 3,000th career assist with a dish to Wayne Ellington for a fast-break layup at the 54.9-second mark of the 1st quarter vs. CHI (2/28/14)…became the 188th player in NBA history to reach 3,000 career assists…handed out a season-high (game-high) 11 assists to go with 4 rebounds and 2 points (2-2 FTs) in 18 minutes at DEN (3/5/14)…12 points (4-6 FGs, 1-1 3FGs, 3-5 FTs), including 10 in 4th quarter, in 23 minutes vs. POR (3/7/14)…with the score tied at 98-98, he converted a go-ahead 3-point play with 24.2 seconds remaining that put DAL up 101-98 (DAL went on to defeat POR, 103-98)…seasonhigh 20 points (6-9 FGs, 4-6 3FGs, 4-5 FTs), including 15 in 2nd half (8 in 4th quarter), to go with 5 assists and season-high 4 steals in 24 minutes vs. IND (3/9/14)…12 points (5-9 FGs, 1-3 3FGs, 1-1 FTs), 3 rebounds and 3 assists in 20 minutes at UTA (3/12/14)…12 points (3-8 FGs, 1-4 3FGs, 5-6 FTs), including 6 in 4th quarter, to go with 6 assists and 2 steals in 20 minutes vs. BOS (3/17/14)…13 points (4-11 FGs, 5-5 FTs), 4 rebounds, 4 assists and 2 steals in 32 minutes vs. MIN (3/19/14)…11 points (4-15 FGs, 3-8 3FGs), season-high 7 rebounds and 6 assists in 40 minutes vs. BKN (3/23/14)…10 points (3-7 FGs, 2-4 3FGs, 2-2 FTs) and 4 assists in 16 minutes vs. GS (4/1/14)…7 points (3-8 FGs, 1-3 3FGs), 7 assists and 2 steals in 24 minutes at LAL (4/4/14)…9 points (3-5 FGs, 1-3 3FGs, 2- 4 FTs), 6 assists and 2 steals in 17 minutes at UTA (4/8/14)…1st double-double with 10 points (4-8 FGs, 2-2 FTs), 3 rebounds, 10 assists and 2 steals in 26 minutes at MEM (4/16/14)…recorded 6+ assists 6 times in the final 7 games of the season (at LAC 4/3/14-at MEM 4/16/14)...underwent left foot surgery (8/6/13)…missed the first 41 games of the season recovering from the surgery (vs. ATL 10/30/13-at PHO 1/17/14)…suffered a sprained right ankle in the 2nd half at CHA (2/11/14)…missed the game at IND (2/12/14) due to the injury…left the game at GS (3/11/14) in the 2nd quarter due to a sore right Achilles and did not return. 2012-13: Averaged 9.9 points, 3.4 assists, 1.1 steals and 24.5 minutes in 58 games (34 starts)…shot 43.8% (194-443 FGs) from the field and 72.7% (112-154 FTs) from the line…as a starter, averaged 11.6 points, 2.3 rebounds, 3.7 assists and 1.5 steals in 28.1 minutes (ATL went 24-10 with him as starter)… 4 games with 20+ points (4-0 record)…28 games with 10+ points (20-8 record)…27 games with 25+ minutes (21-6 record)…recorded 10 DNP-CDs…missed 14 games due to injury (illness; 11/14/12; turf toe, left big toe; 11/24/12; sore left foot; 12/19/12-1/8/13, 2/5/13, 3/25/13). 2011-12: Averaged 11.3 points, 5.0 assists, 1.0 steal and 27.4 minutes in 63 games (all starts)…shot 44.5% (241-542 FGs) from the field, 36.2% (77-213 3FGs) from 3-point range and 74.6% (156-209 FTs) from the line…7 games with 20+ points…35 games with 10+ points…2 games with 10+ assists…14 games with 7+ assists… season-high 28 points to go with 5 assists vs. GS (4/6/12)…25 points, 6 rebounds and 6 assists vs. SA (4/9/12)…27 points (career-best 6 3FGs) at POR (4/18/12)…missed 3 games due to injury: 1 with a strained left hamstring (2/2/12), 1 due to the stomach flu (3/10/12) and 1 with a sprained left ankle (4/4/12). 2010-11: Appeared in 71 games (started 70) for NJ and UTA, averaging 15.2 points, 7.1 assists, 1.0 steal and 31.7 minutes… shot career-high 83.3% (335-402 FTs) from the line…in 54 games (all starts) with NJ, averaged 15.0 points, 7.6 assists, 1.1 steals and 31.9 minutes…in 17 games (16 starts) with UTA, averaged 15.8 points, 5.4 assists and 31.2 minutes… among NBA leaders, ranked 11th in assists…12 games with 20+ points…42 games with 10+ points. 2009-10: Averaged 16.9 points, 3.2 rebounds, 6.6 assists, 1.2 steals and 34.7 minutes in 64 games (61 starts)…20 games with 20+ points…55 games with 10+ points. 2008-09: Averaged career-high 21.3 points, 3.3 rebounds, 6.9 assists, 1.6 steals and 36.1 minutes in 69 games (all starts)…shot 43.8% (455-1,039 FGs) from the field and 82.0% (496-605 FTs) from the line…selected to the Eastern Conference All-Star team...was the NBA’s 3rd-highest scoring point guard, and 1 of only 5 players to average at least 21 points and 6.9 assists…along with Vince Carter, formed the league’s highest-scoring backcourt (42.1 ppg). 2007-08: Averaged 14.8 points, 5.8 assists, 1.4 steals and 31.6 minutes with DAL and NJ…shot 46.3% (321-693 FGs) from the field, 33.5% (56-167 3FGs) from 3-point range and 82.4% (248-301 FTs) from the line...in 39 games (all starts) with DAL, averaged 14.4 points, 5.3 assists, 1.4 steals and 30.4 minutes… in 25 games (22 starts) with NJ, averaged 15.4 points, 3.3 rebounds, 6.5 assists, 1.4 steals and 33.5 minutes...with NJ, had 19 games with 10+ points…dished out his 1,000th career assist vs. CHA (4/15/08). 2006-07: In 80 games (61 starts), averaged 10.2 points, 2.5 rebounds, 3.7 assists, 1.2 steals and 26.0 minutes…shot career-high 49.2% (292-593 FGs) from the field and 82.4% (215-261 FTs) from the line…3 games with 20+ points…44 games with 10+ points. 2005-06: Averaged 9.9 points, 3.2 assists, 1.0 steal and 22.8 minutes in 57 games (4 starts)…shot 46.9% (190-405 FGs) from the field and 71.6% (169-236 FTs) from the line…31 games with 10+ points (DAL was 25-6 in such games). 2004-05: Averaged 5.7 points, 2.2 assists, 1.0 steal and 15.4 minutes…shot 42.9% (157-366 FGs) from the field, 33.6% (44-131 3FGs) from 3-point range and 75.7% (78-103 FTs) from the line…among rookie leaders, ranked 2nd in steals, 5th in assists and FT% and 6th in 3FG%...started the first 19 games of the season…16 games with 10+ points. Selected by Washington in the first round (fifth overall pick) of the 2004 NBA Draft…draft rights traded with Jerry Stackhouse and Christian Laettner to Dallas in exchange for Antawn Jamison (6/24/04)…traded with Maurice Ager, DeSagana Diop, Trenton Hassell, Keith Van Horn, two future first round draft picks and cash considerations to New Jersey for Jason Kidd, Malik Allen and Antoine Wright (2/19/08)…traded with Derrick Favors, two first round draft picks and cash considerations to Utah for Deron Williams (2/23/11)…traded to Atlanta for Marvin Williams (7/11/12)…signed by Dallas (7/31/13). Played three seasons at Wisconsin (2001-04)…averaged 14.8 points, 4.1 rebounds and 3.1 assists in 96 starts, finishing as the seventh-leading scorer in school history…was only the second Badger to start every game as a freshman, sophomore and junior…named the 2003-04 Big Ten Player of the Year as a junior, also earning second team All-America honors by the Associated Press…led Wisconsin to the school’s first Big Ten Tournament title, and was named Most Outstanding Player…as a sophomore (2002-03), averaged 12.7 points, 4.6 rebounds and 3.1 assists in 32 games, helping the Badgers reach the Sweet 16…as a freshman (2001-02), averaged 12.3 points, 3.3 rebounds and 1.8 assists. 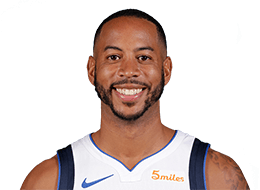 Devin Lamar Harris was born Feb. 27, 1983 in Milwaukee, Wis.…he and his wife Meghan have daughters, Charli and Scarlett…son of Terry and Julie Harris, and has an older brother, Bruce, and a younger sister, Tanisha…majored in sociology at Wisconsin…former NBA player Tony Smith is Harris’ mentor…named Mr. Basketball in Wisconsin in 2001, after leading Wauwatosa East High School to an undefeated regular season…the school retired his No. 20 in 2007…also played a season of high school volleyball, earning All-Conference honors…created the ‘34 Ways to Assist Foundation’ which works to compassionately, spiritually and profoundly impact the lives of children in need by providing hope through wish granting, inspiration through educational mentoring, and healthy living through sports and physical activity…was a Milwaukee Bucks and Brewers fan growing up.